Price is per 16-inch strand of these beautiful beads. Each tiny rondell measures around 7mm x 4mm, about 99 beads to the strand. Coral is not a true gemstone, but a product of marine life. However, it's been used as a gem since prehistoric times. With a history of religious meaning, like being one of the seven treasures in Buddhist scriptures. 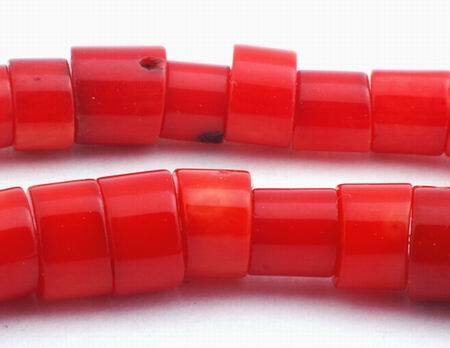 Coral was long thought to be a strong talisman against evil spirits and hurricanes. It is also said to reduce blood flow, helping anaemia, and is thought to give wisdom and prevent madness. Its color ranges from white to red, but most red coral these days is dyed. It grows in branches that look like underwater trees. Most people think of coral on the coral reefs in the South Pacific like the Great Barrier Reef. However, these reefs are formed by a different species than the coral traditionally used in jewelry. Most of this coral is found in the Mediterranean Sea or in the Pacific off Japan and Taiwan.